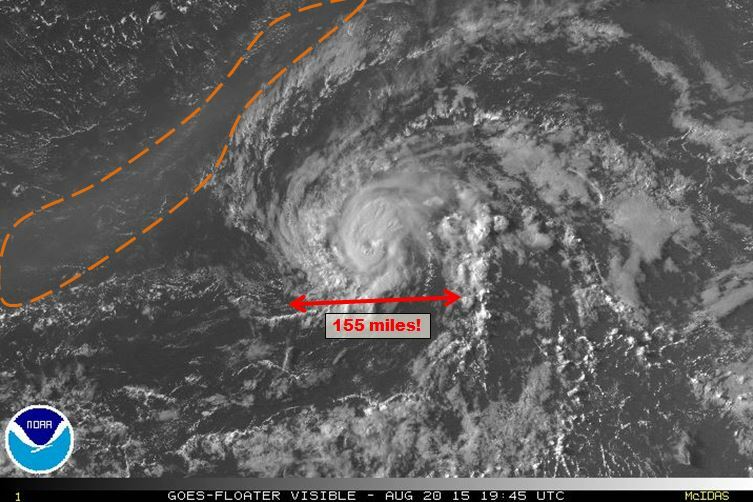 Dr. Gray rang in the active period of the 2015 Atlantic Hurricane Season in his annual ringing of a bell on August 20th, but did he push a turbo button too? At a 8pm ET count, there are ELEVEN disturbances and tropical cyclones being watched for development in the Northern Hemisphere. Two typhoons, a hurricane, a tropical depression and a few other invests and disturbances. As it is August, it’s not too surprising that the tropics are active, but they sure did get active in a hurry. Each invest or area of interest has at least a 20% chance of development over the next 5 days! It’s gonna get busy, so let’s get started. Tonight I will be focusing on Hurricane Danny in the Atlantic, but in the days to come both Hawaii and Bermuda will have tropical threats to watch. I’ll talk about those threats a bit at the end of this post. During the overnight and early morning hours, it became evident that an intensification phase within Danny had begun. 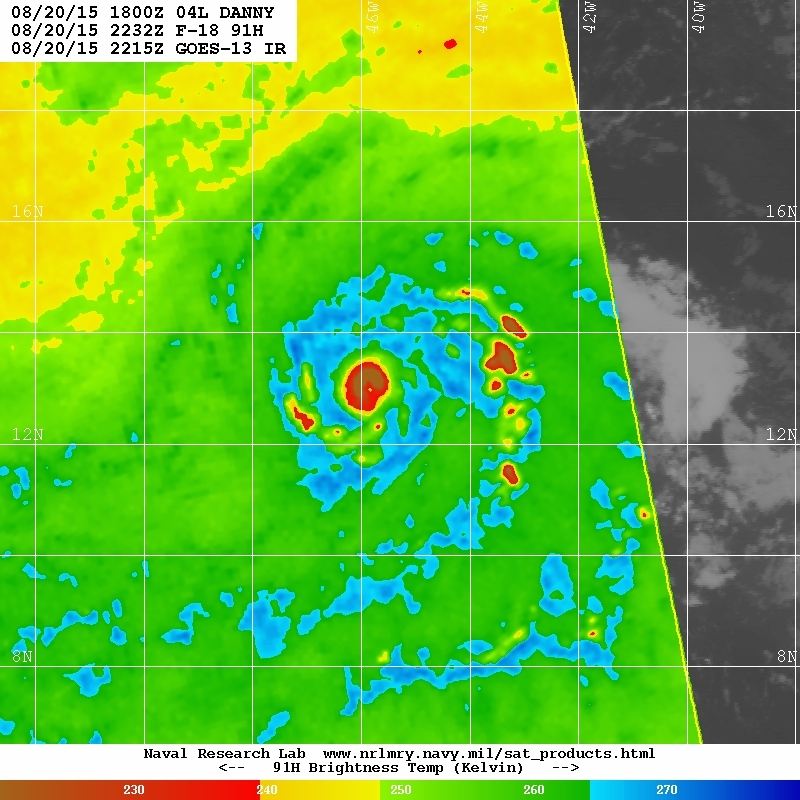 Microwave imagery began to show a very tight, but small core with a nearly closed eyewall. Due to Danny’s shrinking size, satellite estimates were becoming less useful but they did spike in the hours surrounding storm local sunrise. One outlandish satellite microwave scan even tried to show winds of 90 mph, but that was unsupported by other satellites. Soon after sunrise, a warm spot and eventual eye poked through the small central dense overcast. That eye has been transient throughout the afternoon. Recent SSMIS microwave shots show that they eye wall is still surrounding as much as three-quarters of a pinhole eye. Just before sunset, it became very apparent that both dry air and shear is lurking around Danny’s core. In the image below, you can readily see a milky colored gloss to the visible satellite that is representative of dust and the Saharan air layer. There has been a persistent weak band cumulus band to the NW that has visualized Danny’s moist envelope, and has pushed dry air ahead. That band has shown signs of weakening recently, and that may allow dry air to enter Danny’s circulation. Outflow has been decent over the northern half of the circulation, but shear has been apparent as minor asymmetries leaning toward the north at times. A big word of warning about small systems is that models, especially global models, do not handle/resolve these systems well. The GFS is especially prone to this. That being said, the trend has been for a general weakening trend to start tomorrow as the dry air starts to work in. Extensive uncertainty exists due to the small nature of this system, which allows quick fluctuations in intensity. The possibility exists for both intensification and quick weakening. Current models keep Danny at a near constant intensity through tomorrow night. By late Friday or early Saturday, southerly or southwesterly shear should begin to accelerate a weakening process. The overall track model bias across most models has been too far to the east or right of the actual track, and thus the models have shifted some to the left. As with any strong storm, there was a bit of wobbling today, but NHC has done a good job at catching the overall pattern but does remain on the southern side of the guidance pool. An interesting split has developed in recent spaghetti plots with most of the models south and a few possibly feeling a weaker ridge to the north. The track thinking is that the narrow ridge that resides to Danny’s north will push Danny west-northwestward. Together with accelerating trade winds, Danny should accelerate toward the Northern Leeward Islands north of Martinique on Monday. NHC has Danny in the vicinity of the US Territories through Tuesday, but because of the small size of this system small deviations in track could mean huge changes in surface conditions on particular islands. Preparations for a minor hurricane should begin from Barbados to the Dominican Republic just in case. The Hurricane Hunters, and our best eyes on this system, will begin to fly tomorrow morning at 14z/10am ET. This will get much better information into the models and create an overall better forecast. Many flights are to come with Danny over the next 4-6 days. The Central Pacific Hurricane Center and NHC added designations to two tropical systems earlier today. I am far more interested in TD3C than 97L for the simple fact that it could get substantially stronger as it gets closer to land during the middle of next week. Worth a note for the history buffs, Hawaii turns 56 tomorrow! What will likely be Kilo tonight or tomorrow is forecast to intensify throughout the next three to five days as it moves west-northwest and eventually toward the NE as the system finds a weakness in the ridge. Water temperatures are plenty warm enough to support intensification. In a very familiar deja-vu, this system has about a 50/50 shot at rapid intensification during this process. The possible RI process would take place Friday evening into Saturday or Sunday morning. Reconnaissance will be there to see it happen with flights starting tomorrow. 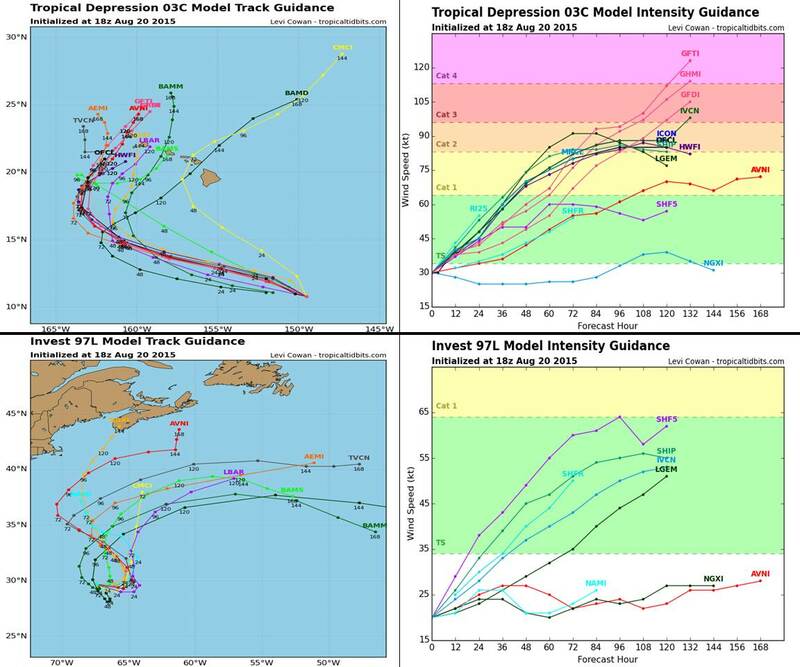 Track and Intensity Models for TD3C and Invest 97L. Courtesy of Tropical Tidbits. Back in the Atlantic, Invest 97L was designated this morning as Danny was intensifying. Subtropical development is possible over the weekend in the neighborhood or just northwest of Bermuda. NHC has given it a 60% chance of development during the next five days. A moderate subtropical system is not out of the question. It would not be anything like the hurricanes of last year that affected the island. Keep your eyes open for tropical trouble if you are in the Caribbean, Bermuda, Hawaii, and far western West Pacific. Each of these areas has current tropical threats with a variety of storms large and small, strong and weak. The news is still leaning toward good in the Caribbean where much needed rainfall is coming, but keep in mind winds could get gusty for an island or two if the forecast holds as it has. I will be following on twitter as always. I have added a link to the NHC to the top left of this page, and I have also added a link to the latest CPHC advisories. Posted on Thursday, August 20th, 2015, in Tropical Weather and tagged 97L, Atlantic, Caribbean, Danny, Goni, Greater Antilles, Hawaii, Kilo, Leeward Islands, Pacific, Tropics. Bookmark the permalink. Leave a comment.